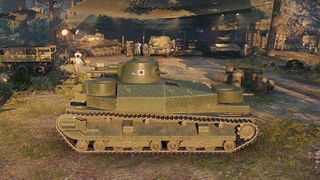 The Type 95 Heavy is a Japanese tier 4 heavy tank. An "evolution" of the so-called Type 91 "Heavy" tank, the Type 95 Ro-Go has twice as much armor as its predecessor. Unfortunately two slices of bread are not much better at stopping enemy firepower than one slice of bread; and even one slice of bread is better than the armour used on this tank. The Type 95 is quite simply a bigger Type 91 with worse guns, and with armour that is vastly inferior to the British Valentine, Valentine AT (which is a tier lower) and Matilda, all of which will eat you alive. As such it plays pretty much the same way as the Type 91 and also shares an awkward derp gun with slightly better penetration on HE rounds... a tier higher. This is a tank which will sorely test both your patience and skill. It is situational in the extreme and relies heavily on its +1 preferential MM. Platooning will throw you into battles you simply are not equipped to survive, let alone to fight. However, if you know how this tank works and the RNG gods owe you some favours, it can be rewarding and will lead the way to its giant big brother. 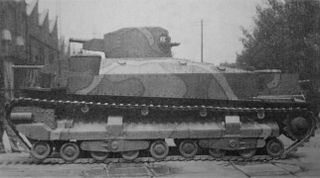 The Type 95 Heavy leads to the O-I Experimental. - Very easy stock grind: It has few modules to research and XP cost is fairly low (only top gun costs 2200 XP and is shared with another tier 4 Japanese tanks). Its stock gun is carried from Type 91 Heavy which is still effective for a tank in this tier provided you can hit anything with it. None of new modules require a new suspension to be mounted. And there's no turret to research. The Type 95 is considered a terrible tank and hated by the playerbase, but it can still do surprisingly good work in the right hands and the right situation. If you're planning to go down this line to reach the O-I tanks, ask yourself on whether or not you will find enjoyment in commanding a tank that's horrible at nearly everything and will almost certainly destroy your stats. If the answer is yes, your prayer has been answered. This tank has a low top speed and poor hp/ton ratio, meaning you will arrive as part of a second wave (if you arrive at all). It does have excellent hull and turret traverse speeds for a heavy tank and as such, it can defend itself in a brawl, although you will almost certainly be trading hit points as your armour will never save you. The 7.5 cm gun in particular is very good for brawling, especially in bottleneck situations such as "Tank Alley" in Himmelsdorf due to its high rate of fire, good penetration, and great damage when using the High Explosive round. Just don't expect to do much sniping unless you are good with derp guns. The paper thin armour of this tank means it can be easily penetrated by most tanks of its tier, and it's cannon fodder for Tier 5s. 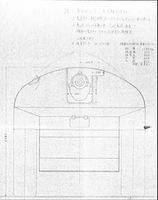 Large calibre HE shells, especially from artillery and tanks mounting howitzer guns, like the T40 and Hetzer, can reliably penetrate the front hull armour of this tank, given it is thin and unsloped, so long as the mini-turrets are not hit. For this reason, in a Tier 5 match, this tank performs rather poorly, being large, unarmoured, and having a rather poor gun, similar to other heavy tanks its tier. 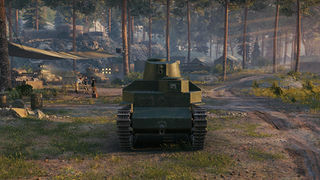 You can follow and support friendly Tier 5 heavy tanks, using them as meat shields, while popping out to fire when the enemy is reloading, or protecting their flanks. In a Tier 5 battle, you should always use your tank in a support role. Do not go out on your own, or attempt to take critical areas yourself, for you are slow, fat, an easy target and a free kill for any Tier 5 enemy you come across. Keep behind friendly heavy tanks or support slower mediums, guard your allies flanks, distract the enemy, pop out to take shots while the enemy is reloading, track enemy heavies you cannot penetrate, and do everything you can to help your allies. Unlike the other two Tier 4 heavy tanks in the game, the Durchbruchswagen 2 and the B1, you have a surprisingly good gun, with far more alpha damage and slightly better penetration. Use this to your advantage, and use peek-a-boom tactics to slowly chip away at your enemies' health, one shot at a time. Take great care as experienced players will target you as an easy kill. In a Tier 4 battle, try to support your more heavily armored tanks like the Matilda, Valentine and AMX 40, letting them take hits and push, while you dish out damage from behind them, supporting them while they take point. Type 95's armour will not save you here either but it does have very high HP pool to take hits if necessary. Just be careful that you're not simply giving XP away; stick to cover and avoid crossing large open spaces. Even tier 4 light tanks can ruin your day. 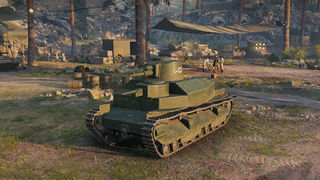 Do not under any circumstances platoon with friends who aren't using preferential matchmaking tanks or you will be facing tier 6 monstrosities which the Type 95 stands little chance against. This tank is rather good at hull-down positions; if you can find a big enough hole or a large enough structure to hide most of your hull, your gun depression, small and bouncy turret, and good gun will allow you to devastate any tank foolish enough to come near you. This way, you will be able to hold important choke points all by your own, dealing steady damage to enemy tanks trying to dislodge you, while being well-protected at the same time, forcing enemy tanks to stop and aim at your tiny turret, which will leave them vulnerable to your fire. An example of a good hull-down position this tank can take is on the Ruinberg map, at sector G3, where there is an important bottleneck for the south team. The Type 95 is just tall enough to fire over the small hole in the wall, exposing only its turret, making it deadly in such a position. It is recommended to never snipe in this tank unless absolutely necessary, for you are a huge target and will get spotted and hit easily, and your accuracy is rather mediocre and it's hard to hit targets far away. You would be wise to consider spending silver or gold on training your gunner and you must under no circumstances use a 50% crew. This tank is an oddity: it plays like few other tanks, and the playstyle is heavily dependent on map, tier, and team lists. You will mainly play a support role, use your great gun to your advantage, help your allies, and with luck and clever playing you'll come out of every battle alive. While that is the optimistic view, it must be said that many or most players will find the Type 95 to be a nightmarish grind, a "necessary" tax considering the awe and dread they will evoke when they finally reach the O-I Exp. This may be time to use those spare personal reserves. The Type 96 Mk. 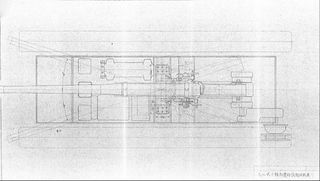 4 Bo carries over from the Type 91 Heavy, and should be installed immediately. Next, upgrade to the BMW IV Kai Ni to receive much better acceleration. From there, get the Type 95 No. 2~4 Suspension to increase your mobility and then finally get the 7.5 cm Tank Gun Type 99 to get a much needed boost in penetration and damage. Then begins the relatively easy grind to the O-I Exp. 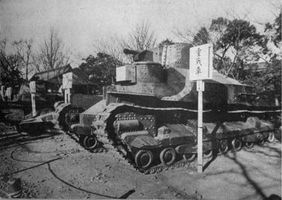 The Type 95 Heavy Tank Ro-Go was a multi-turreted heavy tank. 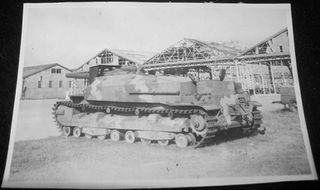 This tank had a total of 3 turrets - its primary turret had a 70mm Type 94 cannon as well as a 6.5mm machine gun in the back, its front turret had a Type 94 37mm tank gun, and its back turret had a 6.5mm machine gun. 4-5 tanks were built, but were never put into operational use. 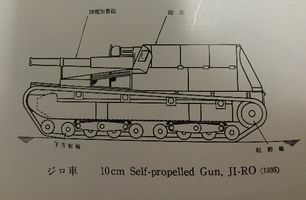 Self-propelled guns were developed on the chassis, including one with a 120mm Schneider-canet naval gun (sometimes mislabeled as a 150mm howitzer) and another with a 105mm artillery cannon. 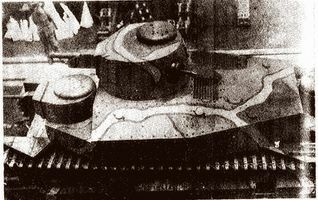 The Type 95 Heavy Tank. Experimental SPG with the 120mm Schneider-canet naval gun. Note that this is sometimes mislabeled as a 150mm howitzer instead. 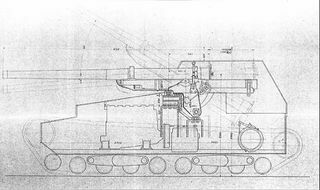 * The 7.5 cm Tank Gun Type 99 was never equipped on the Type 95 prototype, and instead was only ever mounted on the Type 2 Ho-I medium tank, a derivative of the Chi-Ha. 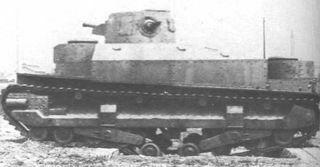 The tank's name (which was discovered after its implementation into World of Tanks) was the Ro-Go. This page has been accessed 40,706 times.